It was in 1994 that the potential of the coffee sector and retail in particular, and the agriculture sector in general, was brought home to me in a telling fashion during a meeting with a director of Tchibo, Europe's second-largest coffee roaster. The director took me through the company's origins, and how the Tchibo family first began in a small 10x10 feet shop, which in Hamburg [Germany] would not have cost more than $100 in 1948. This conversation had a huge impact on me? that a 10x10 ft operation could grow to 200,000 tonnes of branded coffee in 45 years! India's population has crossed 1.25 billion and nearly 65 per cent is dependent on agriculture and allied sectors. Yet, the contribution from this sector to the country's gross domestic product (GDP) is only around 18 per cent. India is the second-largest producer of agricultural produce such as fruits and vegetables, flowers and raw silk. We also produce massive quantities of wheat, rice, sugarcane, oil seeds and palm oil. But where is the advanced agro-processing, the value addition, the forward integration? One industry that showed true potential initially was the milk industry. The classic example is Amul, whose success was largely based on two fundamental tenets Verghese Kurien propagated - one was seeding the sense of ownership the farmers felt about the cooperative society and the other was building a strong brand in the form of Amul. India's milk output has reached an estimated 140.6 million tonnes in 2014. With this, India has come a long way from being a milk deficient country in the 1970s to becoming the world's largest milk producer and consumer today. The lessons a small entrepreneur can derive and implement out of this cannot only transform the way he looks at the business operations but also the deep-rooted relationship and interdependence between various factors in an ecosystem. One needs to realise that the entrepreneur's stake in developing his ecosystem is as important as the ecosystem's stake in a small entrepreneur's development. Today, we at Coffee Day operate a successful "Bean-to-Cup" model. We have been able to achieve this over the last two decades mainly due to two critical factors - a sense of ownership among all stakeholders and this focus on brand-building. In the process, we have created 18,000 direct jobs. Our dream is to create 100,000 jobs. There is much to learn in the story of coffee itself. The 1980s saw great volatility in coffee prices. The prices fluctuated from 50 cents to $2 per pound. This fluctuation worried growers and dented their confidence in the growth potential. If not for the persistence of a few small entrepreneurs who believed in growing the ecosystem around them, the story of coffee in this country would have taken a different trajectory. Today, this industry creates direct employment for over a million people, mainly small farmers and plantation workers, besides creating indirect employment for millions more. But coffee, like other agri-products, is plagued by several structural considerations. The size of landholdings is one. Ninety-five per cent of growers have less than five hectares. This scenario is particularly debilitating in almost all the other agri-products. It is high time the government explores innovative ways to incentivise farmers to come together in a collective way. It will change their economics, their ability to use technology, their ability to manage risk, and finally the way they negotiate to get the best prices. The journey in this sector has just begun in India. Let me put this in perspective. Worldwide, the estimated total production of coffee in 2013/14 was 140 million bags, with an average realisation of $15 billion to $20 billion to farmers. But the world coffee retail industry is valued in excess of $100 billion. The gap is starker in a country like India. This not only highlights the multi-fold benefits in forward integrating, but also underscores the potential to empower many million farmers globally, who can make their lives better by letting this wealth trickle down. With the philosophy of "Bean-to-Cup", Coffee Day has been able to move up the chain of integration to several diverse segments, from retailing to manufacturing coffee machine, to setting up training academies for underprivileged youth that makes them employable. The one standout thing we have learnt is that we can only grow when our ecosystem grows with us. Along the way we also changed the culture of social gathering in this country. We made coffee cool - youngsters realised that it was not just the pubs that were great places to meet and hang out! Now, to emphasise if such leaps can be made in other areas in which we are naturally endowed in, the farmers can truly start mining the potential to make it big. WITH INTERNET AND MOBILE CONNECTIVITY NOW AVAILABLE ACROSS THE SPECTRUM, WHAT STOPS US FROM USING THE BOOMING e-commerce platform to solve the distribution and infrastructure handicap that our farmers and small entrepreneurs face? Nothing. There are many sub-sectors where we have this edge. There is a lot of untapped opportunity in poultry, fruits, cotton and horticulture. Take fruits, and see what European brands have done by means of value addition. Fruits like strawberry, peach, kiwi, etc., can fetch a syrup manufacturer 30 times more value per kg than it would to the farmer who grows them. Why could we have not done this in India? Our expertise and knowledge leadership in information technology can, in fact, be a huge contributor in initiating and nurturing this kind of forward integration. With Internet and mobile connectivity now available across the spectrum, what stops us from using the booming e-commerce platform to solve the distribution and infrastructure handicap that our farmers and small entrepreneurs face? Nothing. In fact, no agro-entrepreneur should underestimate what the Internet and e-commerce can do for him. As Ray Kurzweil, the Futurist and Chief Engineer at Google, predicted that 20,000 years of progress would be crammed into the next 100, thanks to technology. Additionally, one can never overemphasise the importance of growing the ecosystem by nurturing small entrepreneurs. This will not only give us inclusive growth, but is also a step towards assured business success. And our own personal experience with coffee is a clear example. We tend to associate entrepreneurial success and employment generation with large IT companies. But the agri-sector can do it too. Hundreds of companies can come out of India, not just creating wealth, but creating employment for the bottom of the pyramid. India's growth story has just started. And this sector can not only meet the domestic demands but also fulfil the employment needs of an emerging country. Using technology, both home-grown as well as imported, can give the farmers and the small entrepreneurs a substantial boost to progress and compete aggressively on the world stage. 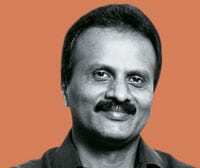 The author is the Chairman of Amalgamated Bean Coffee Trading Company, which owns the Cafe Coffee Day chain of outlets. Siddhartha, who started coffee retailing in 1996 is one of the few entrepreneurs in India straddling the entire value chain in an agri produce - in this instance, right from coffee plantations to processing to trading to manufacturing coffee machines to coffee retailing.